A sermon preached on April 14, 2019 – Palm Sunday – and the occasion of the baptism of Zach Thomas Bothe . Let the same mind be in you that was in Christ Jesus, who, though he was in the form of God, did not regard equality with God as something to be exploited, but emptied himself, taking the form of a servant, being born in human likeness. And being found in human form, he humbled himself and became obedient to the point of death– even death on a cross. From the outset of Lent, we’ve been hearing Jesus’ call to all persons to “repent.” We’ve noted that repentance isn’t commonly understood correctly. It is not about groveling in the dirt with self-contempt for all the sins you’ve committed. It is means to change your mind. What is the mindset that we need to move away from to adopt the mind of Christ Jesus? It is the one that arises from our animal nature and our upbringing in which we see the world as a competition for survival. It assumes a scarcity of good stuff so we must clutch to what we can take for ourselves. It’s about looking out for #1, climbing the ladder of status, ascending to the place of personal glory. The mind of Christ is focused in a different direction. Paul invites us to imagine the second person of the trinity – the one who is typically referred to as the Son although in the Redeemer’s pre-existent form there was no gender – as having been in the eternal glory of heaven where there is nothing but love he did not clutch to his exalted place but rather chose freely to descend, to be take on human form, entering the evolving cells of Mary’s womb. Born at the bottom of society in homelessness and poverty, he led the life of a servant, embracing the humiliation of the cross in a great self-offering for all people. Life for Christ Jesus was not a competition for a scarcity of the good stuff, but a trust in the abundance of God’s grace; the glory of God that fills the whole creation. To be a disciple of Jesus is to intentionally engage in process of coming to see life with the mind of Christ, letting go clutching, climb of the ladder, the eternal quest for personal glory. You may remember the temptations of the devil we contemplated at the outset of Lent. The devil was encouraging Jesus to hold firm to the world’s way of thinking. To ascend to personal glory, rather than to take the path of a servant and the sacrificial love God was calling him to express. There is a great tension between these two paths in the story of Palm Sunday. Jesus enters Jerusalem, and for a little while he is showered with praise as the people assume is going to ascend to the throne and from that exalted place give the people what they want: the Romans and corrupt religious leaders driven out – their restored “glory” as God’s chosen people. They seem to overlook the repercussions of the fact that Jesus rides into town on a humble donkey and not a war horse. Jesus has come not to give them the piece of the pie they want. He has come to offer himself as sacrifice of love, revealing the love for all people that is at the heart of God. Now I said at the outset that Jesus declares that all people need to repent. That it’s not just the so-called “bad people” but all people who need this transformation of the mind. There is, however, one exception to this call to repentance. Do you know who that would be? Children. It is not appropriate to expect children to repent. Let’s ponder briefly the a child’s development. When they are first born, they have no separate “self.” They are one with all that is. The perceive the underlying unity of love that is the Kingdom of God. But gradually a separate self begins to evolve. “There is me, and there is the world, and I am at the center.” And in the years that follow this self – this ego – hopefully is strengthened. Ideally we pour a great deal of love into these children and they come to view themselves as worthy of love. We praise them, celebrate their moments of personal glory – their first steps, learning to read, their successful recitals and soccer goals, their performances in plays – all by way of building them up – strengthen their sense of being a separate self that can stand on their own two feet. Since this is a broken world, this raising up of a child will not occur imperfectly. There will be with every child ongoing insecurities and self-doubt, but that’s okay. It is the cracks, as they say, that let in the light. Our frailties provide a place of connection. But at some point in the journey of life each person is invited to the place of recognition that living for one’s own personal glory isn’t the endgame. Climbing the ladder for our own personal glory ends up leaving one empty inside. The realization begins to dawn that we were made for a higher purpose that to merely survive, or beat out the competition, or to acquire status and stuff. This self we have spent a life time building up is not an end in itself – it must be sacrificed in service of the glory of God — a glory that encompasses all creation. We learn to loosen our tight grip on what is “mine” and offer ourselves up as vessels of God’s love. It is for this that we were born. If we haven’t begun to grasp this truth before – parenthood has a way of driving it home in dramatic ways. This little child is recognized as inherently valuable – inherently holy – in spite of the fact that for a good long time they are essentially useless and incredibly consuming of our time and resources. To be a parent is to lay down your life for your children. 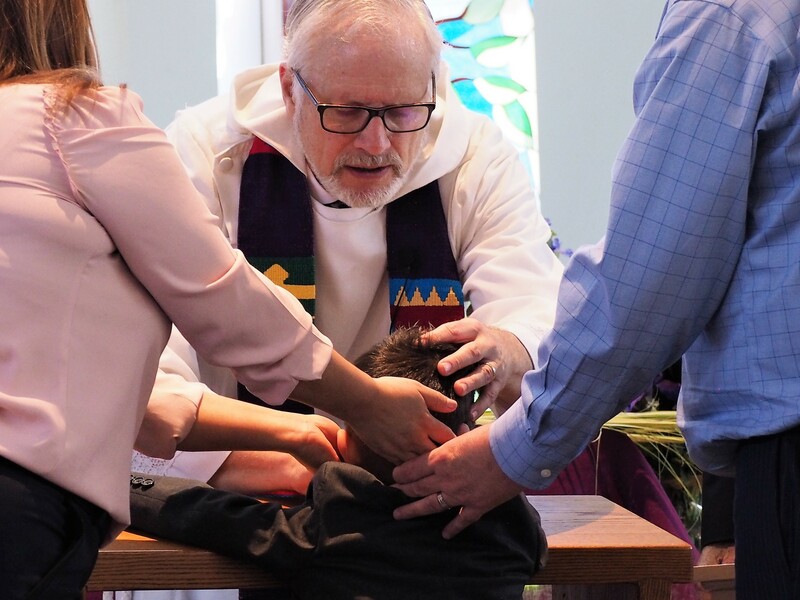 This may have been the first time I’ve baptized a child on Palm Sunday and it made for interesting reflections to the baptism of a child and the movements of Palm Sunday side by side. The faith of Sandra and Brian, and all of us here today stands in for the faith of Zach, which in this context means that personal decision to follow in the way of Jesus – to embrace the life of a servant, ultimately of all people. Brian and Sandra, in the baptism liturgy you were asked a question: Will you nurture Zach in Christ’s holy Church that by your teaching and example he may be guided to accepted God’s grace for himself, to profess his faith openly, and to lead a Christian life? And you said yes. We make these promises as parents recognizing that you cannot force Zach to be a full follower of Jesus. It is a choice that he must make for himself, and we are far too early in the game to even talk about such a thing in its deeper meaning. With the love you pour into him he is in the process of forming a self, and hopefully one day with some degree of security in that self he will choose to begin laying it down sacrificially in love for this broken world, following in the footsteps of Jesus. He will recognize that in the end it is not his personal glory that matters, but God’s glory. Along with Sandra and Brian, we will teach Zach about God and Jesus and about connecting to God in prayer. We’ll teach him the golden rule, and encourage sharing. But the most powerful thing we can do is try to be the best examples we can of a live lived in service to God and every human being looks like. Hopefully if we walk the walk together, surrounding Zach with a community where forgiveness and love is lived out, even when it isn’t easy, along the way he will absorb the grace that abounds here, and this embodied grace will make the choice somewhere down the line to follow in the way of Jesus more enticing, for he will have grown up experiencing the joy of being a part of a community that sees life differently from the way the world commonly sees it – trusting in the love of God that is greater than all the forces of death that would divide us. He will recognize that the true King was a servant who lay down his life for all out of a love infinitely larger than our own little loves.